This post originally featured on our comprehensive network site covering football all over the world, footballbh.net. In this mini Catalunya derby, Barcelona wanted to reassure their fans after Copa del Rey defeat against Sevilla. Valverde looked to secure a win in order to guarantee his five points’ lead above Atlético. He also needed to make sure his team stays physically fresh and able to play an intense game and rebound against Sevilla on Wednesday. On the other hand, Girona were in search for their first La Liga victory since November 25. The Catalans had played six games in the last 18 days, five of them were against La Liga’s top clubs. With a crucial home game against Real Madrid this Thursday, Barcelona’s reception seemed to be challenging for them. In this article, we will try to look in depth at what happened during the game using statistics and tactical analysis. Taking into account Oussmane’s Dembélé’s absence due to injury, Ernesto Valverde aligned his best XI. It was a new chance for Coutinho to shine again. Positioned on the left wing, the Brazilian wanted to prove that he can be as effective as the injured Frenchman, (even though I personally believe that playing the ex-Liverpool star in midfield will be not such a bad idea). The trio Alba-Coutinho-Démbélé on the left side deserve a real chance and can bring more excitement to the team. To trust this, we can just have a look at the 2015 Alba-Iniesta-Neymar combination under Luis Enrique. On the other side, Girona appeared under 3-5-2 shape. Christian Stuani, the team’s best goalscorer, was back to the starting XI after a two-match absence. If we take a look at the first half statistics, we can assume that Girona did have a quite good game. Despite being led since the ninth minute, they attempted eight shots of which three were on target including two big chances. Eusebio’s team had also attempted 206 passes which is as high as the 81% of Barcelona. Their pass accuracy was quite similar to their neighbour’s (83% for Girona and 84% for Barcelona). It is really rare that such numbers occur in a Barcelona vs mid-table team match. The locals chose to face the La Liga giant with no fear and tried to control the game. Although, having several possession sequences, Girona did not really create huge scoring chances. 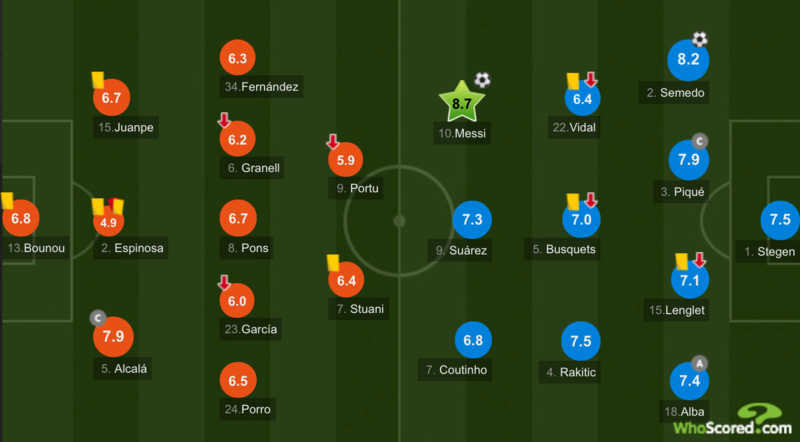 During the first minutes of the game, they did not succeed in beating Barcelona’s pressing in their own half. 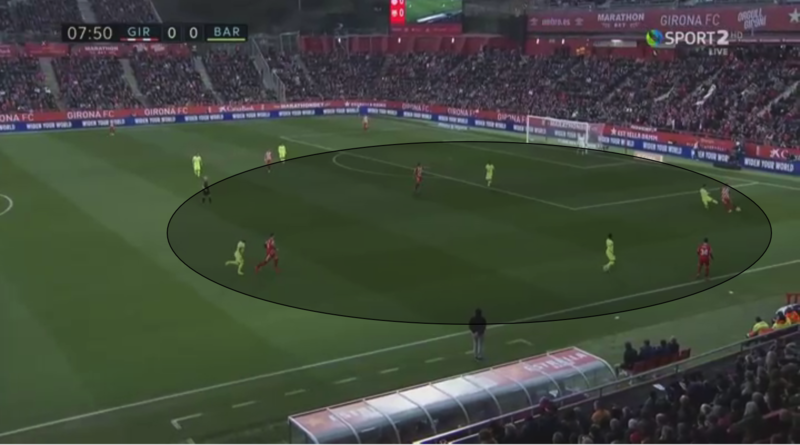 Here, Barca tried to block their opponents’ three centre-backs with the up-front trio ( Messi-Suarez-Coutinho), Nelson Semedo was closing down and Arturo Vidal covering the right half-space. There were no pass options available for the ball carrier. 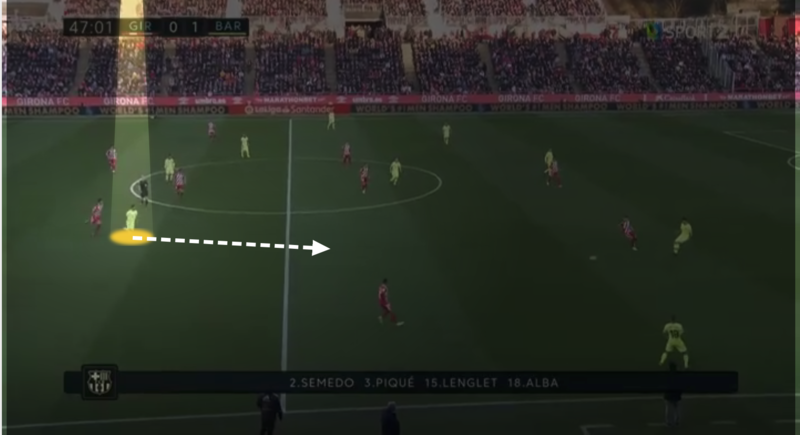 This situation happened multiple times on both flanks and ended often in long balls won by Piqué and Lenglet. It did so happen that Eusebio’s team used the space in midfield to get over Barca’s pressing and succeed to exit the ball. This was realised often using space in-behind Luis Suarez as the striker did not reposition himself to cover pass options to the centre. Although, this sequence alongside other more comfortable circulations mostly resulted in progression through the sides. They often ended in ineffective crosses. Only two successful crosses over 12 for Girona during the first period. Numerical superiorities were nearly impossible to find as Barcelona occupied what we call the three zones of the pitch with four players: Semedo, Piqué, Vidal and Busquets. This was one of my favourite moments during this match. It was a pleasure to watch how the whole Barcelona’s team managed to get the ball out of their own half. Ter Stegen acted as a real Libero. 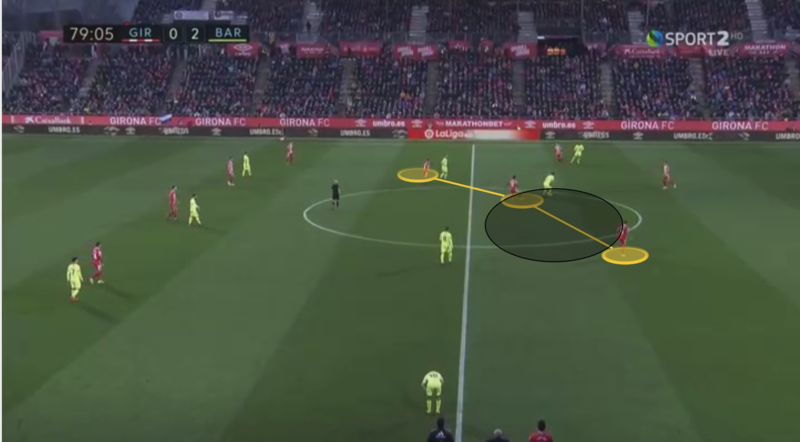 We will try in this section to analyse through various situations how the visitors get over Girona’s pressing. 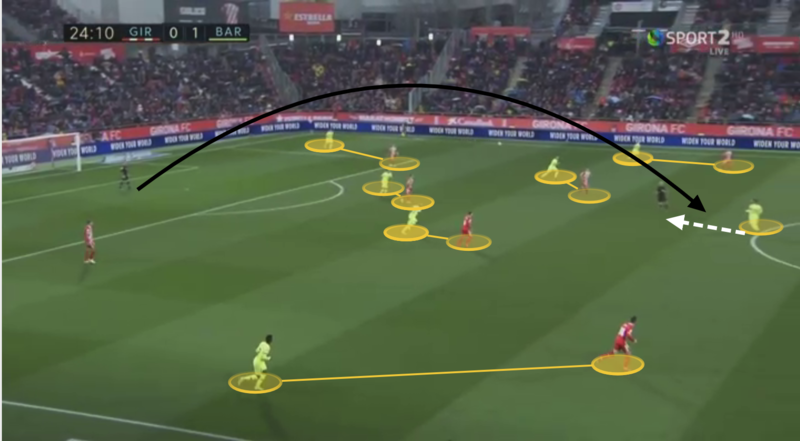 Whether Barcelona attempted backwards passes to attract the opponent and then open spaces in their backs or were simply forced to get back due to intense pressure, the Blaugrana used some interesting connections to get the ball out of their defensive zone and start a new attack. 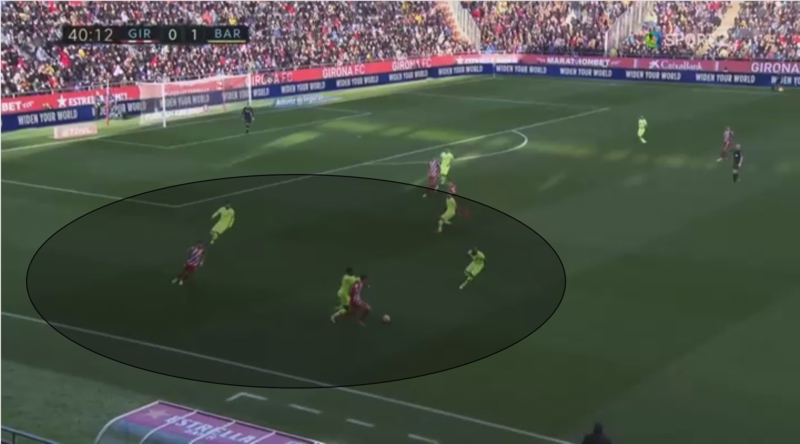 As we see in the pictures below, when either Port or Stuani started to run towards Piqué or Lenglet, they get the ball back to Ter Stegen. As one of the attackers continues his runs toward the German keeper, both defenders moved either backwards or forwards to get out of their opponent’s cover shadow: pass lines are then created. 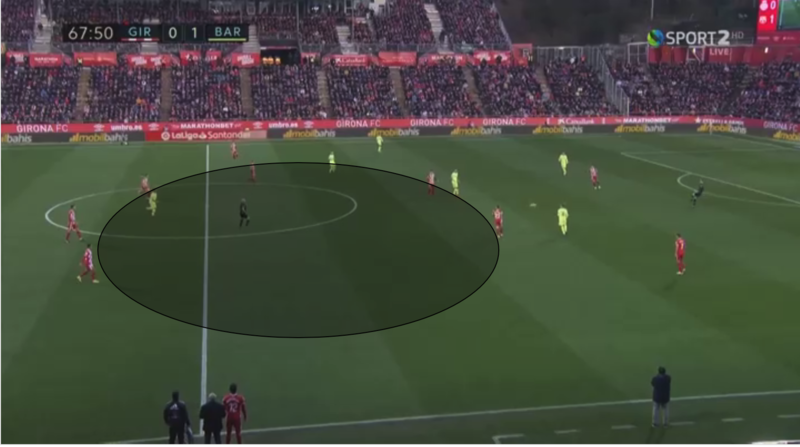 In the picture below, there were seven Girona’s players marking all Barcelona’s defenders and midfielders. 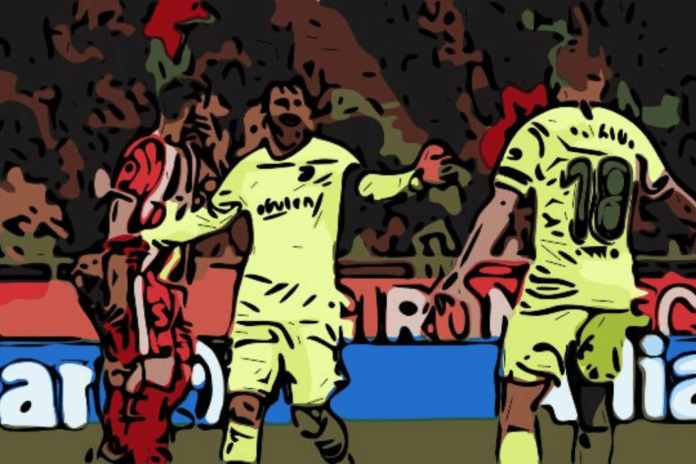 Girona had two attackers to press Barca’s centre-backs, they were closing down Semedo and Alba and their midfield trio was on Busquets, Vidal and Rakitic’s shoulders. Here, Ter Stegen attempted a long ball to Messi. The Argentinian is free and even when he was not he had always the time (and the technique as well) to hold the ball and protect it. One Last noticeable thing in this section is Suarez’s dropping back in numerous situations to give the ball-holder another pass option and to liberate space behind him as he always had an opponent trying to close him down. What happened after the red card? Bernardo Espinosa was sent off in the 50th minute, Girona switched then to a 4-3-2 system. The first impact that this change had on Eusebio’s team was the stepping back of the defensive block. They were also unable to press the opponent in an intense way while staying compact. Holes will eventually appear as they played an 11 (including Marc André Ter Stegen) vs nine game. 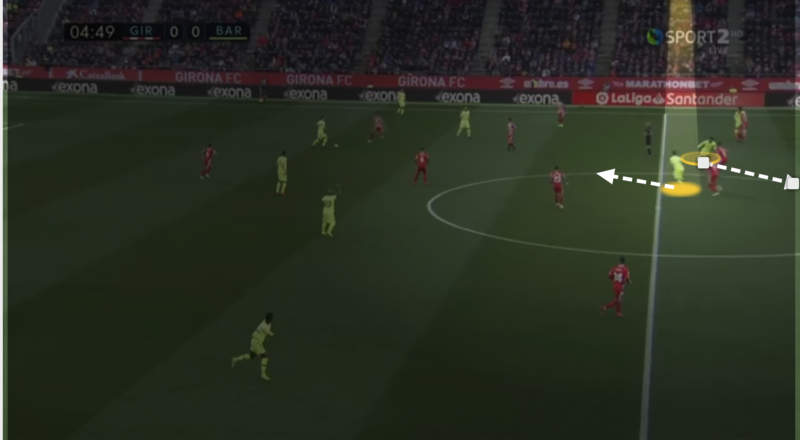 Lionel Messi’s goal is a perfect example of Girona’s pressing limits, (analysed later). Secondly, as the local team had only two centre-backs, they couldn’t go high up on the pitch to follow Suarez’s dropping back. They used to do so in the first half when they were three at the back. When one of the centre-backs goes out of position to close down an opponent, the other two cover his back. 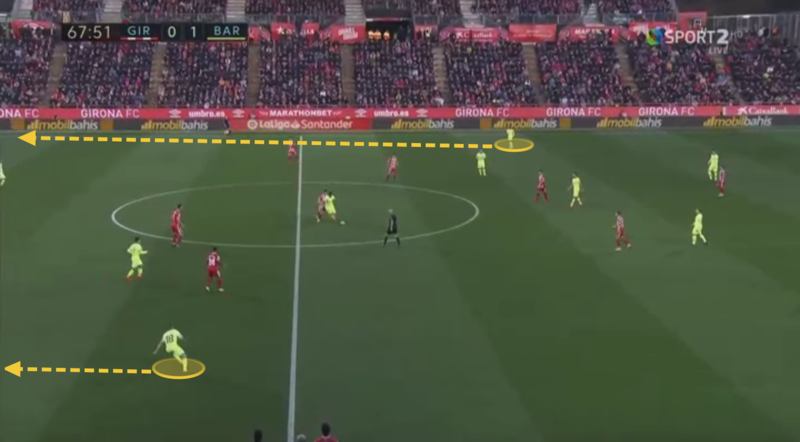 Last but not least, spaces between the three Girona men in the midfield line was quite large. 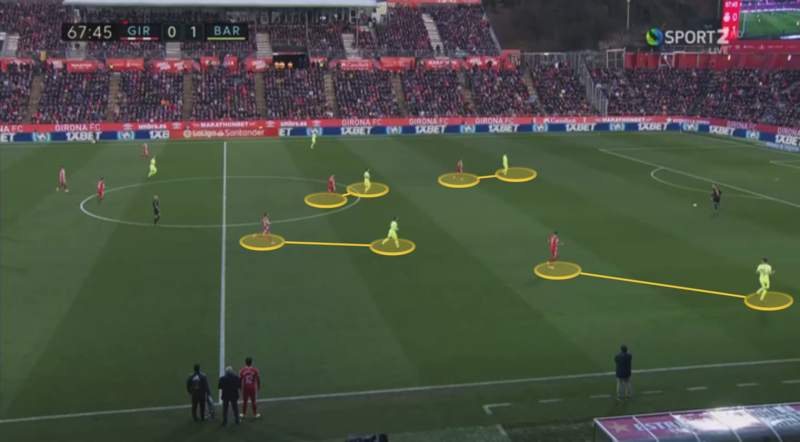 Although they did not change their midfield structure, more spaces appeared after Espinosa’s sending off. 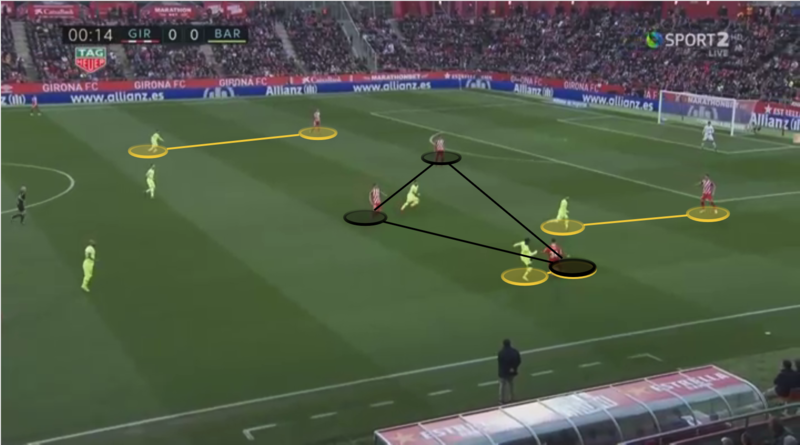 A three-man line is always defensively vulnerable, they cannot cover all the pitch’s width. In this case, one of the centre-backs comes into midfield to fill the gaps. If you dispose of three CBs it’s possible, with two it’s a bit harder…. This was a typical Barcelona attacking phase during this game. An attack started by Ter Stegen as a Libero. There was a 4-v-4 situation in Barcelona’s defensive third. This was one of the few times in this match when Girona lacked compactness. There was a huge space separating the defence from the rest of the team that was occupied by only one player. As we said previously, Suarez’s dropping back was important throughout the match. The Uruguayan is known to be one of the world’s best players in protecting and covering the ball while he has his back to the net. Semedo and Alba were not pressed and both were able to make runs in-behind. The ball goes to Alba and Messi’s magic finishes it in style. Barcelona did not manage to have consecutive and intense possession sequences, especially during the first half. As we said, they wanted to manage the game calmly and get the three points with the least possible effort. Semedo’s early goal did not affect Girona’s will to dominate the game and get possession sequences. It was Espinoza’s red card that caused numerical inferiority, felt in different zones of the pitch, which was crucial for the locals.